And it's not a death, resurrection, or a zombie. Also, I think many of you are going to find it somewhat annoying, if that helps narrow it down at all. Spoilers for Green Lantern Corps #36, which just came out yesterday. It seems like nowadays the members of the Green Lantern Corps, the Sinestro Corps, the Indigo Tribe, and all the other light spectrum warriors trade rings and colors like some people do t-shirts. 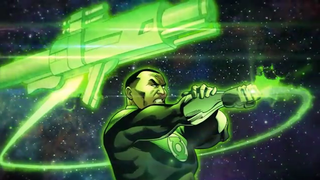 Now John Stewart has just become the first male Star Sapphire in the history of the DC universe. Hmm. I wonder what makes John Stewart so different that he's completely clothed from the neck down? I guess we'll never know. Still, it's always nice when a man can succeed in a female-dominated job market like this, isn't it?